TechTalks.ph has been a proponent of Philippine startups and as part of our ongoing efforts as startup enabler and ecosystem builder, it is our joy to be the bearer of good news. The Philippine government’s Department of Science and Technology (DOST) recently funded five (5) tech startups for a total of 24M. They always had funding and support available for Research and Development (R&D) efforts in the academe. This has been a valuable tool for researchers and scientists in local universities. But the requirements for said funding were not really suitable for today’s tech-startups. There are also ongoing initiatives to help such innovations to be commercialized and be brought to market although we have not seen massive success in this area yet. The good news is that DOST-PCIEERD recently funded 5 startups as part of their brand new pilot program. In their role to promote STEM in the Philippines, they have noted in the past that there has always been funding available for the startups for their R&D. But like any other government or private initiatives it does not come as an infallible benefit to the tech startup space. The process, infrastructure & collaterals required has been difficult to meet - given the unique nature of our startups. Who are these Philippine startups and what made them worthy of being funded? 1. Grayscale Marketing (for the Smart Vision Project) Grayscale offers software programming, mobile app creation, multi-lingual call center support, Web and ICT development services to their prospect clients. Grayscale recently started to offer ICT and software programming services that are focused on improving the PWD accessibility features and multi-lingual support protocols of their prospect clients' software and hardware products. They are now starting to develop their own software products and hardware devices for local and overseas PWD communities. Currently, there is no existing software in the market that allows the blind and the visually impaired users to wear smart eyeglasses and provide accurate audio descriptions to inform visually impaired users about the physical objects around them and its distance at any moment. All smart eyeglasses in the market today are not specifically designed with accessibility features, but are rather created for visual activities like watching video content, augmented reality and gaming. The Smart Vision project is worthy of the funding because of its cause to provide the blind and the visually impaired people a system that would make them become less dependent. There is a huge demand and market for the product in the Philippines and abroad. 2. Easybus PH Inc. Easybus PH Inc. is a startup company started in May 2013 providing total digital booking solutions designed specifically for the Philippines’ provincial bus transport that will modernize the ticket booking process, empower the passengers and ultimately impact the overall efficiency of the local transport industry. Bus digital presence may have started a few years in the country, but realizing its full capacity to integrate information technology that will significantly impact both bus operators and the riding public has not yet been implemented. Existing competitors in the market mainly act as 3rd party travel agencies and/or an in-house developed web booking system that still need verification and longer confirmation time. Easybus PH Inc. is the only company to provide a total digital booking platform that is single, synchronized & centralized system between the booking officer, conductor and passengers which is adaptable by any bus operator either small or large bus companies for all booking processes for all types of passengers. It aims to solve the problems on manual booking process, double booking & miscommunication between the ticketing office and passengers, redundant trip management, terminal congestion and inaccessible trip information. Adopting the technology will result to saving of resources for the passengers in the form of cash, time, effort etc. while bus operators will have a realignment of resources from 'brute' manual force into a leaner and more efficient operations. The Easybus technology has the potential to be the new standard in bus booking in the Philippines. 3. Machibox Inc. MachiBox Inc., is a startup company composed of MAPUA engineering students. Currently, the company is developing an easy-build, easy-to-program and cost effective robotics kits called MachiBox which aims to increase interest in programming and robotics among students/beginners. Robotics, being a technical subject, pre-requisite knowledge that is quite challenging is required. Coding and hardware development should be learned. For grade schools and early high-school students, these subjects are overwhelming for them. Also, schools have to buy robotics kits which are quite expensive. This is where MachiBox comes in. MachiBox aims to develop a robotics kit that is cost-effective, easy to code, easy to connect robotics kits with ready topic guide for students and teachers. With this solution, we will have a bigger pool of students and schools engaged in robotics. 4. Retailgate Retailgate is an AI Technology-based Retail Analytics and Market Research firm started in 2016 that provides tech-based consumer behavior tracking services. With a team of dedicated technopreneurs with both business and engineering background, the company focuses on consumer understanding to aid retailers make better targeted offers of products and services, better evaluation of their market strategy and help them efficiently manage their resources. Retailgate is the only company to provide data on consumer count, traffic and journey. They also capture consumer engagement by detecting consumer age, gender and mood. They make market research cheaper, faster and enjoyable. 5. Rurok Industries Inc. The Rurok bikes Industries is a start-up company that developed their first product, the Rurok Cordillera, towards the end of 2015. The situation was perfect as things fell into place and the team grew organically. On November 2016, Rurok announced the much awaited official release of the Cordillera. Rurok Industries was officially incorporated and became an official business entity on February 2017. The Rurok Industries have a grand vision of improving the stature of local bicycle brands. The goal is to introduce a locally designed, high performance bicycle that is on par with the best foreign brands with the aim of achieving two things: First, elevate the image of local bicycle brands by increasing the level of local bicycle design and engineering. Second, jumpstart the local industry by creating demand for a high quality, locally designed bicycle. These two innovations will drastically improve the performance cycling experience and address two of the most common complaints of performance cyclists and that is: (1) the inefficiency of full-suspension bicycles when it comes to pedaling (i.e. the amount of effort lost due to suspension forces), and (2) The inability of current bicycle models to adapt to different terrain and equipment requirements (e.g., changing wheel sizes when needed, etc.). The total grant for the five approved startup companies is around Php 22M and this will be used for the enhancement of prototypes, market validation and testing. 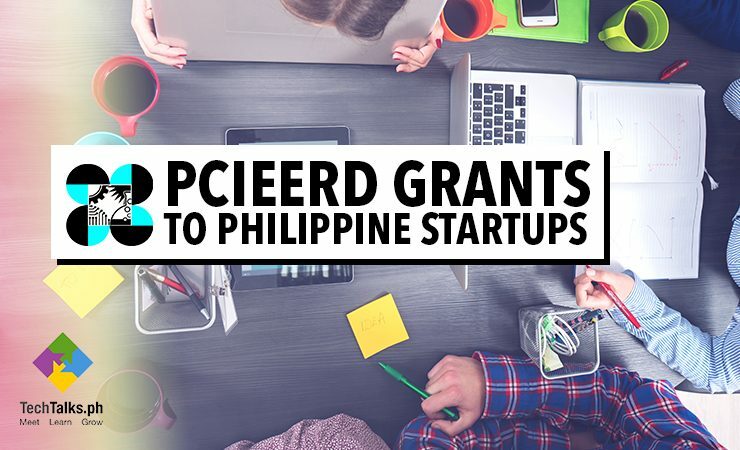 They are not required to pay back the grant from PCIEERD however, the government may require royalties as part of the availed grant and will be covered by a license agreement which will be deemed exclusive to the startup. Is this grant available to other startups? Startup companies can apply the Technology Startup Support Program of PCIEERD. This program is a government initiative that strengthens and supports the Philippine Innovation Ecosystem through partnership with startups who need financial support for product research & development and market validation studies. This program provides fund assistance to overcome R&D roadblocks, strengthen the IP, establish initial market traction, refine the business model and connect the startups with experts and/or entities that will provide expertise in technology or product development, market development and business development. There are two funding tracks which startups can apply. First, the Idea-2-Technology Assistance (i2Tech)track which is for startups with early stage prototypes (pre-incubation grant) and require assistance in product improvement, market testing, data gathering, business modelling etc. Qualified applicants for the i2Tech track should be a legally registered startup (DTI min) with at least 1 year in operation and has an early stage prototype or proof of concept (concepts not allowed). The criteria for evaluation include: technology readiness, technical viability, potential market, financial viability and socio-economic impact. Second, the Innovate & Scale Assistance (iScale) track which provides assistance in scaling up operations, testing of products for certifications, rolling out of services, etc. Qualified applicants should be a legally incorporated startup (SEC min) with at least 3 years in operation, has an established business model and a minimum viable product with at least 1 confirmed client. The criteria for evaluation include scalability or plan for scaling up is viable, clear go-to-market strategy, qualified management team, validated product by at least 1 customer and investor share (on top of startup counterpart). The coverage of the funding are salaries, materials, testing fees, professional fees, travel and representation expenses and equipment outlay.